The President of Georgia State University bestows the title, Emeritus, on faculty and administration who have distinguished themselves through research, teaching and/or service with ten or more years of honorable and distinguished service. In 2002, the Georgia State University administration suggested creating the GSU Emeriti Association, an organization that would connect retired faculty and staff who had been distinguished as Emeriti. The Coordinating Committee, a group of emeriti professors representing each of the University’s colleges, facilitated the development of the Association, beginning with the writing of the ASSOCIATION BYLAWS outlining the terms of membership and the duties of officers and sub-committees. In 2011-2012, the Association celebrated its 10th anniversary and changed from a Coordinating Committee to a BOARD. 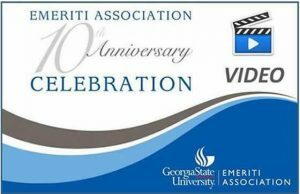 In 2016, the Emeriti Association welcomed emeriti faculty from Georgia Perimeter College as it consolidated with Georgia State University. The Georgia State Emeriti Association is an active member of the Georgia Higher Education Retiree Organization (GA-HERO) and the American Retiree Organization of Higher Education (AROHE).